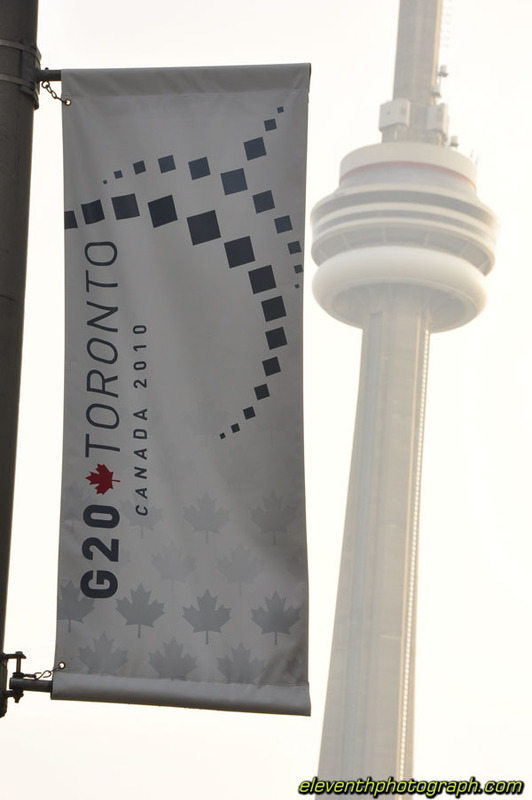 I've managed to upload my photos from the G20 event in Toronto. Full update later. Lots of yelling and shouting in the busy areas, plenty of spectators, photographers, trouble-makers, police and others were present in downtown Toronto during the G20. Smoke could be seen, yelling could be heard, reports could be watched, and the shock could be felt. Having spent about 3 hours Saturday evening and 2 hours on Sunday in downtown T.O, it was a great experience for me personally to get this hands-on view on what went on. Yes, there were lots of police officers, if you think 40 police in one area means that another sector would have left, you'd be clearly mistaken. I walked nearly the entire perimiter of the 3-meter tall fence, and there was a minimum of at least 1 one police officer every ten meters. That was near the much less traffic-heavy southern side. Hundreds more were along the east and northern sides of the fence, creating a fairly impenetrable barrier. Even Andy Dufresne from The Shawshank Redemption would have had trouble tunneling his way to the inside. I wasn't present for most of the larger events that went on during the weekend (such as the police cruisers set on fire, or the graffiti, or the broken windows), but I managed to snap some photos of the aftermath, and even some photos of the third police cruiser that went to flames. It was a dangerous area at the time on Saturday, but many photographers came prepared, some with helmets, and others with gaurds for their body.